Louisiana Scholastic Press Association | An organization dedicated to Louisiana's high school journalism teachers, advisers and students. The LSPA Summer Institute (formerly the Louisiana Scholastic Journalism Institute) provides an intensive one-week training program for high school sophomores, juniors, seniors and incoming college freshmen. 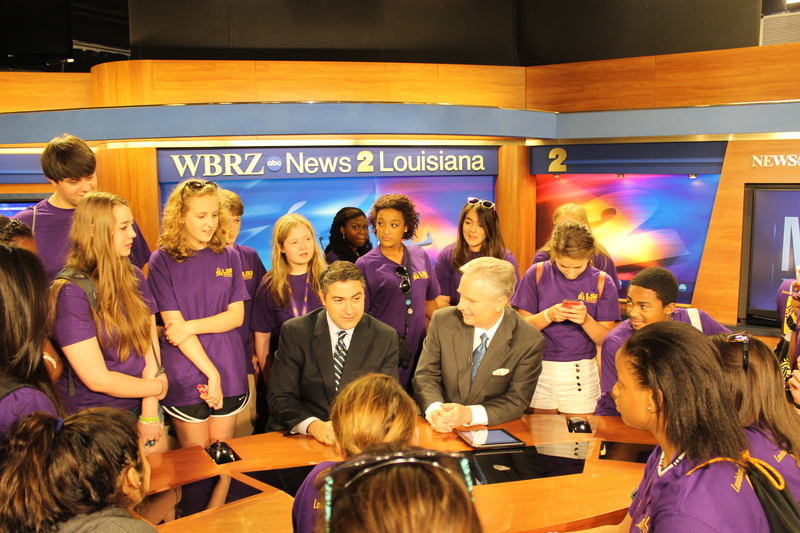 The mission of the Summer Institute, which is sponsored by the LSU Manship School of Mass Communication , is to provide students with the skills needed to produce top-notch scholastic media, including newspapers, broadcast, yearbooks, multimedia and social media. Students work closely with faculty and media professionals utilizing Manship’s state-of-the-art production facilities. They build strong journalism skills and receive a taste of college life, while spending four nights under supervision in one of LSU’s residential facilities. The LSPA Summer Institute is recognized as the Southeast’s No. 1 high school media-learning program. The LSPA Summer Institute helps you explore and experiment, bringing to class your own journalistic skills and unique point of view. The program gives you an understanding of where journalism and journalists are headed in the digital world. You will use the Manship School’s advanced broadcast studios and writing laboratories to learn the fundamentals of media: writing, editing, design, videography, photography and more. You’ll discover new techniques and tools to improve your skills as well as the quality of your school’s publications and broadcasts. Activities include workshops, production projects and guest speakers. High school sophomores, juniors and seniors interested in journalism and mass communication and/or those involved in the school newspaper, yearbook or broadcast news program. You will stay in residence facilities located on the LSU campus. Most meals will be in LSU dining halls. Faculty members and graduate students closely supervise all activities. The program fee is $450, which covers overnight housing, meals, snacks, educational materials, T-shirt and activities. Participants are responsible for travel to and from the LSU campus. Payment must be in the form of a check or money order, payable to LSPA. Credit cards cannot be accepted. Please complete all forms. The deadline for receipt of ALL forms and a non-refundable $100 deposit is April 15. You may pay the full $450 at that time. Or you can pay the balance by May 1, 2019, the final deadline. IF YOU HAVE ANY QUESTIONS ABOUT THE REGISTRATION PROCESS, PLEASE EMAIL lspamanship@lsu.edu. Click here to download, print and fill out the LSPA Summer Institute registration forms (includes the summer program application, medical insurance form, liability agreement, etc.). Click here to download the UREC Participation Agreement. Print and complete both sets of form. Please note: Registration form should be submitted with non-refundable $100 deposit (or full payment of $450) by April 15, 2019. If you choose to pay the deposit by April 15, the balance payment and the remainder of the forms are due by no later than May 1, 2019. Write check or money order to: LSPA.